A teacher from Ash Creek School in Sunizona who had enjoyed watching me as Dusty Vail, subsequently submitted a grant application to the Arizona Commission on the Arts naming me as the Artist in Residence. The grant was approved, and my job as a storyteller was to introduce the art of the Chautauqua to all the K-8 students at the school. . The result was an original and creative show, “A Wild Ride Through Time: A History of Sulphur Springs Valley,” performed by the students to a large and receptive audience at the conclusion of the residency. For me, it was truly a “wild ride” full of surprises and a new respect for what kids can accomplish when a school supports the arts. The philosophy of Ash Creek is to enhance academic learning through arts integration. At the heart of the campus is the original 1912 one-room school house, built the same year Arizona became a state. This charming historic building currently serves as the public library, and is a poignant reminder of the people and events that have contributed to the diverse culture of the area. When I first arrived, I wondered how a small arts integration school could survive in a community where no-nonsense, hard work, plain talk and independence are a way of life. I soon learned that the school has been bringing in artists from different disciplines for several years. The students have come to love the arts, and the community supports and appreciates the different programs presented by the school. (1) By bringing art and history together in public performance, students are able to honor early settlers and acknowledge the respect current residents have for the land. (2) As students research and interview key people in the area, several core educational concepts are easily integrated into the project. (3) Student enthusiasm grows as the project develops. Some children who might find history less than exciting become eager learners, motivated by a new way to creatively explore the past. 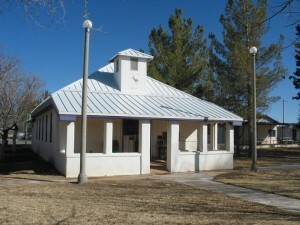 Sulphur Springs Valley has a rich history of interesting events, including the exploration of the Spaniards in their search for the “seven cities of gold.” The area was once home base for the Apache and the stronghold for the elusive Cochise. The region was also part of the westward movement, attracting adventuresome homesteaders and making dreams come true for miners and ranchers in the late 1800s and early 1900s. We asked students to compose stories from information obtained during the research and interview phase of the project. Proofreading and story evaluation were the next steps in the process. Finally, at age-appropriate levels, students were taught how to best incorporate each story into an original script written by students in grades 6-8. The entire process was designed to reinforce student knowledge of local history, social studies, geography and complement English language studies. By the end of the Ash Creek residency, several students had helped make costumes, props, the set, and take on the technical responsibility of serving on the crew. Teamwork, cooperation, negotiation and problem solving were a few of the learning benefits of this additional work. Because of a shift in the population of the area, Ash Creek School currently has just fifteen students (K-8). Every child in the school participated in the project in age-appropriate ways. I found it amazing that this rural school took on this ambitious arts learning project with such enthusiasm and grace. This is an example of why I so love doing what I do. Teaching and learning through art is a very good thing.